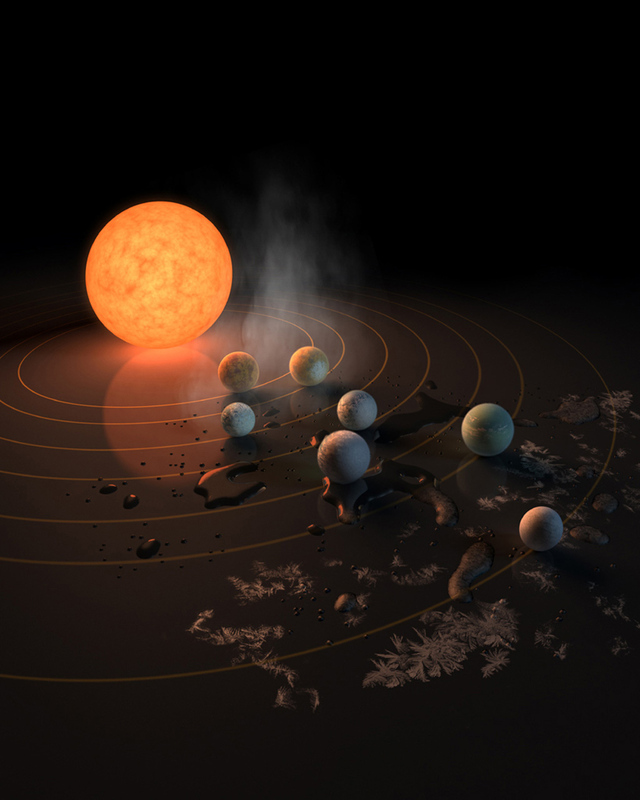 NASA held a press conference today, announcing an exciting new discovery: A record-breaking seven Earth-sized planets have been discovered orbiting a star located about 40 light years from Earth. Three of these planets are firmly located within what’s called the habitable zone–the area around a star that is likely to have rocky planets with liquid water. The star is named TRAPPIST-1 (also known as 2MASS J23062928-0502285). It’s an ‘ultra-cool dwarf’ star, with approximately 8% of the mass and 11% of the radius of our Sun. Size-wise, this is approximately the difference between a basketball and a golfball. The seven plants surrounding TRAPPIST-1 orbit much closer to their star than Earth does to the Sun. As well, these exoplanets are much closer to each other than the planets in our own system. You could stand on one of these planets and see the next closest one with a similar type of view that we have with the Moon here on Earth, and you could clearly make out the disc-shape of many of the other planets rather than mere points of light. The discoveries were made using data from the Spitzer Space Telescope, which was launched in 2003. Although Spitzer wasn’t specifically designed to observe exoplanets, the suite of instruments it carries allows it to discover exoplanets in the same manner that the Kepler spacecraft uses. These observatories can discover exoplanets by precisely measuring dips in the light emitted from a star that coincides with a planet orbiting in-between that star and our vantage point and blocking a portion of the light that we can measure. Continued observations can determine orbital periods, distance from the star, and the number of exoplanets in a system. This data can be used to plot habitable zones. During the press conference, the team stated that they had preliminary mass measurements for six of the planets, and they believe that one is likely to have a water-rich composition. There currently isn’t a system for naming exoplanets in the way that bodies like asteroids are named, so they’re simply provided with alphabetic designations appended to their host stars’ name, with the designation ‘b’ being the closest to the star. These planets orbit so close to their star that they’re likely tidally-locked in the same manner that the Moon is to the Earth. These planets would have permanent day and night sides. One of the planets, Trappist-1c, is very similar in size to Earth and receives about the same amount of light as Earth receives from the Sun. It could very well have temperatures similar to those we have on Earth. Trappist-1f has a 9-day orbit and receives about as much light as Mars does. Trappist-1g is the largest planet in the system with an estimated radius 13% larger than Earth. All of the planets are within a few times the distance between the Earth and the Moon of each other, and being so close to their star their orbits (their years) are about 1.5 Earth days for the closest planet and 20 days for the furthest. The next step, which is already ongoing, is to study their atmospheres and to look for water. This can be accomplished using a technique called transmission spectroscopy. We have observatories that can do this now, such as the Hubble Space Telescope, and the future James Webb Space Telescope (JWST) will be able to push these capabilities even further. JWST will be able to look for greenhouse gas content and determine the surface temperatures of these planets, as well as detect gases that are produced by life. 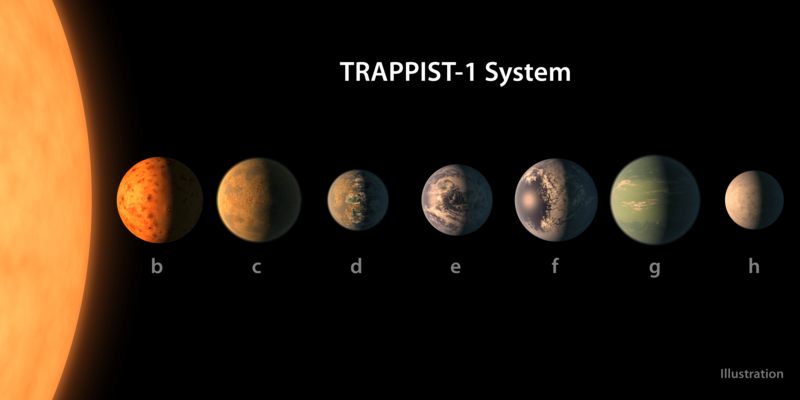 It’s expected that the first cycle of observations of the JWST will include the TRAPPIST-1 system. 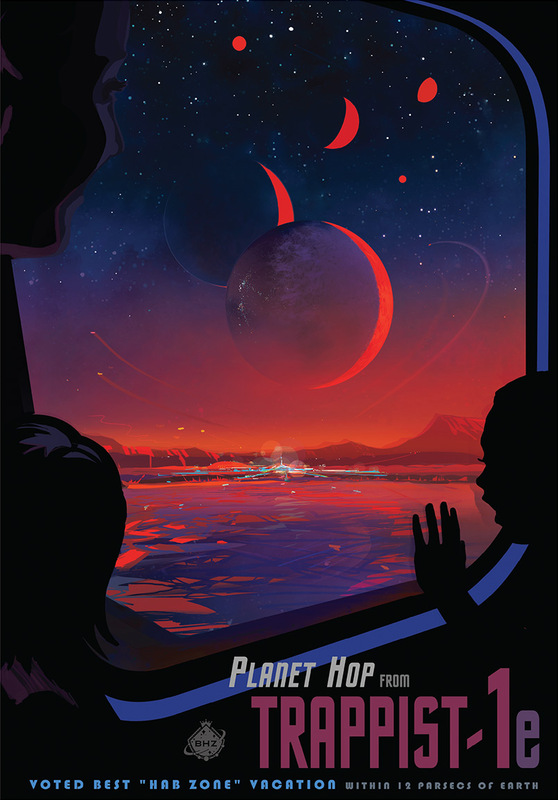 Thomas Zurbuchen, associate administrator of the agency’s Science Mission Directorate in Washington, referred to our moment in time as “the gold rush phase of exoplanet discovery.” It was just in 1995 that the first exoplanet was discovered, he explained, and that thousands have been discovered since. Following the announcement, the panel held a Q&A session. During the course of their answers, they explained that there was no indication of these planets having moons, but that if water was present there would be tidal activity resulting from the other planets. They said they expect substantial progress in determining the atmospheric composition of these exoplanets within the next 5 years, utilizing the Hubble Space Telescope and the James Webb Space Telescope after it begins operations in 2018. JWST’s transmission spectroscopy will cover the range needed to determine the potential for life. One member asked if any attempts have been made to listen to the system with SETI-style instruments, to which there was a reply that SETI itself had listened to the system but hadn’t picked-up any signals. One of the most interesting answers came from Zurbuchen, when he was asked when we could expect to construct a craft that could journey to this system. Rather than give an estimate in the number of years in the future we could expect such capabilities, he answered with the estimated “number of miracles” that are required before we get there. He explained that the JWST required 10 miracles to become possible. He likened the construction of a craft that could explore TRAPPIST-1 as requiring “100 miracles”, but that we shouldn’t be dissuaded, that to get there you have to “start inventing your way forward.” Some of the “miracles” require advancements in propulsion systems and radiation-protection, and that the good news was that substantial work is already being accomplished towards about 5-10 of these miracles. He said it’s about “leaning forward” and “not backing up”. Discoveries like these are constant reminders of just how big and amazing our Universe is. We’re reminded that the night sky isn’t just full of points of light, but worlds, perhaps some of which might be very similar to our own.